An outstanding Mennonite Brethren evangelist and leader, Heinrich Voth (28 January 1878-23 October 1953) was born near Bingham Lake, Cottonwood County, Minnesota, as the oldest son of Elder Heinrich Voth. His father was the leader of the local Mennonite Brethren church and also a teacher. Heinrich S. Voth completed his secondary education in 1896. He taught public school in 1899 in Langdom, North Dakota. 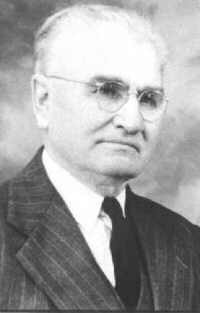 In 1900-1901 he was worked distributing religious material; he attended McPherson College, McPherson, Kansas, in 1901-1902, and in 1902 he was designated by the Mennonite Brethren Church of North America to serve as an evangelist, a position which he held until 1908. On 28 August 1904, he was married to Susie Warkentin, daughter of Johann Warkentin of Winkler, Manitoba. On 5 December 1908, he was ordained as minister in the Mennonite Brethren Church of Winkler. He served as pastor of the Mennonite Brethren churches of Dallas and Portland, Oregon, between 1909-1916 and then resumed his position as evangelist in 1916 until 1920. Following this he settled on a farm near Winkler and served as minister to the church there. In 1931 he accepted the pastorate of the Mennonite Brethren Church of Winkler, Manitoba, and served in this capacity for 20 years. Voth served on numerous committees during his active life, several of which should be mentioned. He was vice-chairman of the Mennonite Brethren General Conference in 1924-36, 1939, 1943, 1945-48. He was a member of the Board of Foreign Missions between 1927-53, serving either as vice-president or secretary. He was a member of the General Conference Board of Education between 1930-36 and member of the Board of Welfare of the General Conference from 1930 until 1943. He served as Board chairman of the South Side Mission in Minneapolis, Minnesota, between 1921-36. He also served as chairman of the annual Northern District (Canadian) Conference for 18 years. H. S. Voth was a man of breadth and force, with keen insight and tact in dealing with social problems. A characteristic phrase, "O Herr hilf, O Herr lass wohlgelingen," (O Lord help, O Lord, let it succeed) will linger long in the ears of those who knew him well. Voth, Abraham. "Voth, Heinrich S. (1878-1953)." Global Anabaptist Mennonite Encyclopedia Online. 1959. Web. 24 Apr 2019. http://gameo.org/index.php?title=Voth,_Heinrich_S._(1878-1953)&oldid=131216. Voth, Abraham. (1959). Voth, Heinrich S. (1878-1953). Global Anabaptist Mennonite Encyclopedia Online. Retrieved 24 April 2019, from http://gameo.org/index.php?title=Voth,_Heinrich_S._(1878-1953)&oldid=131216. Adapted by permission of Herald Press, Harrisonburg, Virginia, from Mennonite Encyclopedia, Vol. 4, p. 858. All rights reserved. This page was last modified on 12 March 2015, at 07:54.